Several cucurbit fields throughout the state are experiencing problems with Phytophthora capsici fruit and root rot. This is not suprising since rain favors this pathogen and NC has received heavy rainfal this growing season. However, it is important that you determine if P. capsici is in your field since this pathogen can be difficult to control. P. capsici fruit rot symptoms include water-soaked lesions that are covered in white spores that look like powdered sugar. 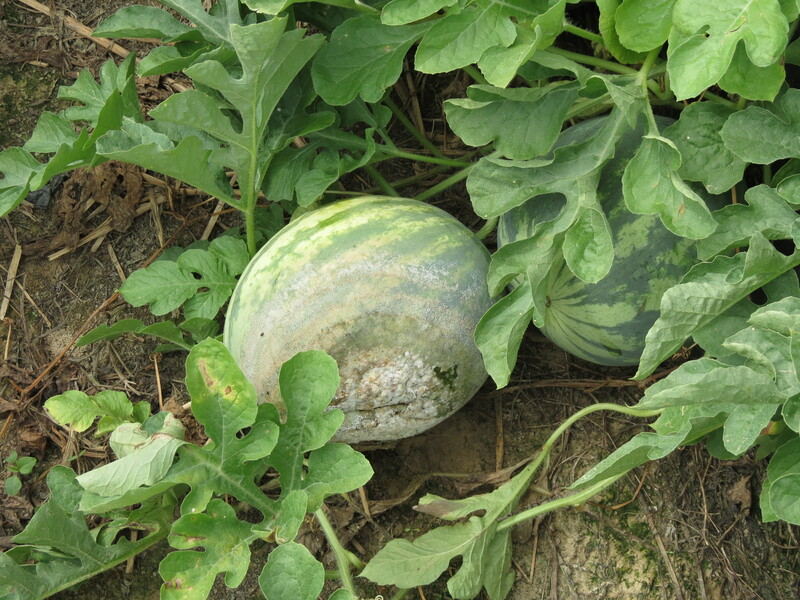 Phytophthora capsici fruit rot on watermelon. Note the water-soaked lesion covered with white spores that look like powdered sugar (Photo Dr. Lina Quesada, NCSU Vegetable Pathology Lab). P. capsici root rot symtoms include wilting, rot, stunting of the plant and plant death. Some of these symptoms can also be seen when plants have a Pythium or Fusarium root rot infection, and it is important to determine which pathogen is causing disease since control strategies will be different depending on the pathogen. Watermelon and cucumber vines are typically less susceptible to P. capsici than squash. However, all the fruit are highly susceptible, especially if fruit are in direct contact with soil. 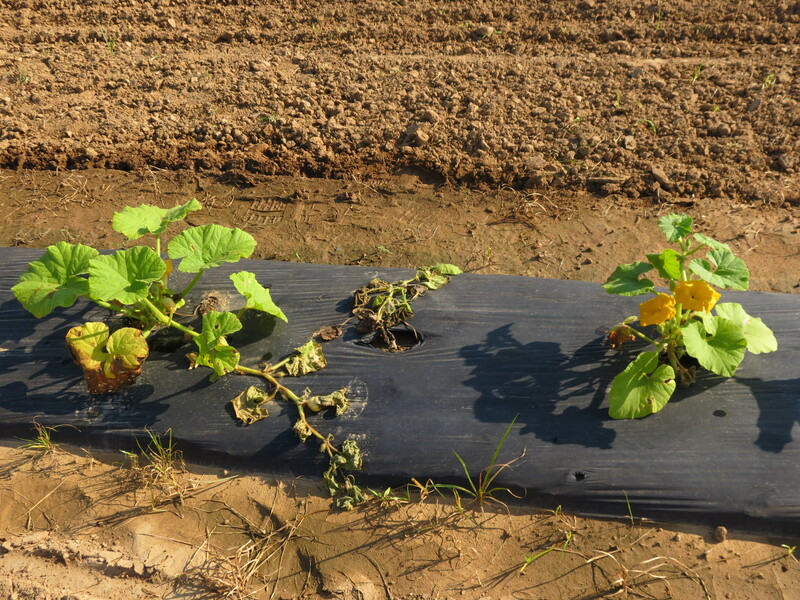 Wilting and plant death caused by Phytophthora capsici on squash (Photo Dr. Lina Quesada, NCSU Vegetable Pathology Lab). 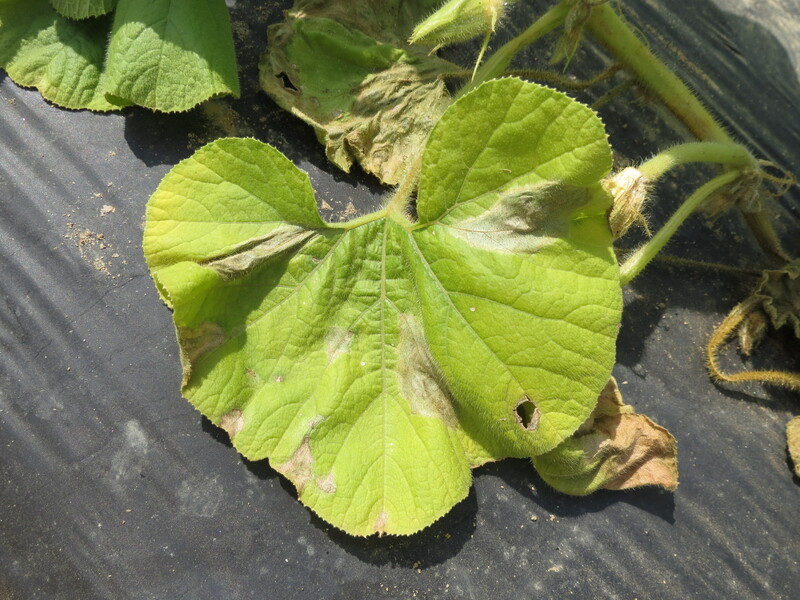 It is also possible to see Phytophthora capsici leaf blight symptoms on cucurbits, especially after heavy rains and in areas with standing water or conducive to soil splashing on leaves. Phytophthora capsici leaf blight on squash leaf (Photo Dr. Lina Quesada, NCSU Vegetable Pathology Lab). Further information about disease caused by P. capsici and control strategies can be found in this disease factsheet and in the NC Ag Chem Manual. The Vegetable Pathology Lab will continue to publish information about this pathogen and we have compiled Phytophthora capsici alerts here. Many factors can influence control strategies for P. capsici and in some cases a field-specific approach will be needed to manage disease. If you think P. capsici is infecting your cucurbits please contact your local Extension Agent and send photos and/or physical samples to the Plant Disease and Insect Clinic for assistance. Follow us on twitter and facebook for more veggie disease alerts. • Do You Know How to Diagnose Cucurbit Downy Mildew in Different Cucurbit Crops?